OR IS IT USELESS BITS OF TRIVIA? This blog segment has no central theme other than random observations that we have found interesting. We hope that you enjoy these useless bits of trivia. What time is it in Kadina? What time is it in Edmonton? 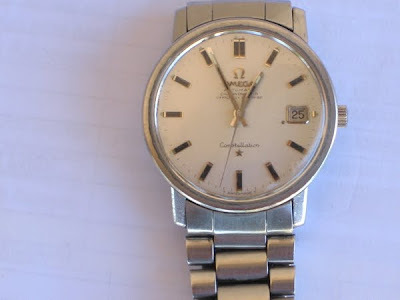 To determine the time in Kadina, South Australia, you need a watch which has both the hour and minute hands. Look at the watch. For example in Edmonton, the time on your watch says that it is Thursday, 12:55 PM (i.e. the minute hand is on the eleven and the hour hand is on the one). 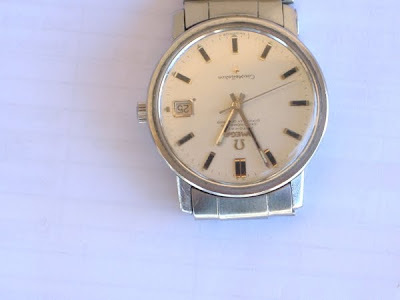 Simply turn the watch upside down. The minute hand is now in the five position and the hour hand is in the seven position. The time in Kadina is Friday morning at 7:25 AM. Yes it was an Engineer who told us about this one. How do those guys figure out stuff like this? Moving objects such as water flowing down a drain veers to the right (clockwise) in the northern hemisphere and to the left (counterclockwise) in the southern hemisphere. This is due to a phenomenon known as the Coriolis Effect. The Coriolis Effect is the apparent deflection of a moving object when it is viewed from a rotating reference point such as the earth. However, there is a word of caution. One may not always observe this phenomenon when looking for it in a small sink or toilet. The Coriolis Effect is generally too weak to affect small bodies of water; consequently one can observe both clockwise and couterclockwise flowing drains in both hemispheres. For small flowing basins, the direction that the water drains is usually determined by a number of factors such as the shape of the basin, whether the drain is offset, and most importantly, the way the water was moving when it commenced draining from the basin. 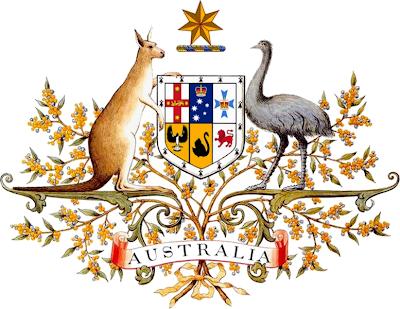 Two animals are present on the Australian Coat of Arms: the Kangaroo and the Emu. Strangely these animals have one thing in common which is why they are on the coat of arms. Both of these animals cannot walk backwards. Hence the reason for their presence on the coat of arms because one of Australia’s maxims is to always move forward, - never go back. Australia has coins in the following denominations: five cents, ten cents, twenty cents, fifty cents, one dollar and two dollars. Unlike Canada, they do not use any colloquial jargon such as a “loonie” or “twoonie” to describe any of their coins. When we have asked to borrow a nickel, or dime they have no idea that we are respectively referring to a five cent and ten cent piece. We also find it interesting, since they have no one cent coin, that prices in the store are still marked to the cent. For example if the price of a product is marked $7.97 cents, the charge at the till is rounded off to the nearest 5 cents. In this example, the fee paid at the till would be $7.95. As part of it’s public transit system, Adelaide has the “O-Bahn”. 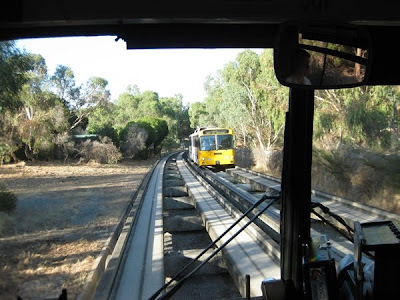 The O-Bahn is a guided busway system that uses elements of both a bus and rail transit system. The O-Bahn transit concept is similar to the CN vehicles that we see in Canada that are able to drive on both road and rail. The O-Bahn buses travel on roads along residential designated bus routes picking up passengers. 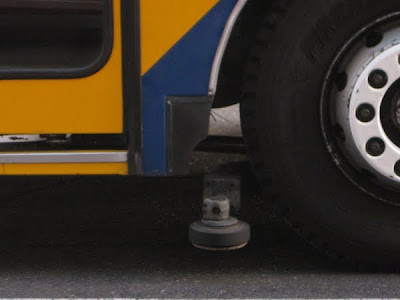 The bus then transfers seamlessly onto a guided track system made of cement with a high rim from which special wheels attached to the bus guide the vehicle downtown at speeds up to 100 km/hr. While on the tracks, the driver is not responsible for steering the vehicle. Once downtown, the bus transfers effortlessly back onto the roadways to off load passengers. The system was designed by Daimler-Benz from Germany and hence the origin of the name. • The O-Bahn appears to be a smart innovative mode of transportation. Buses are able to travel in residential areas and then transfer onto a track system that enables the vehicle to avoid traffic congestion while travelling to and from the downtown core. Passengers have the luxury of not having to disembark and embark and wait at transfer stations while traveling to and from work. 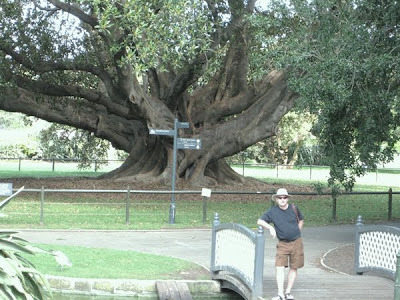 Throughout our travels in Australia we have enjoyed the massive presence of the Moreton Bay Fig. This tree is similar and equivalent to our grand old maple and oak trees; only larger. 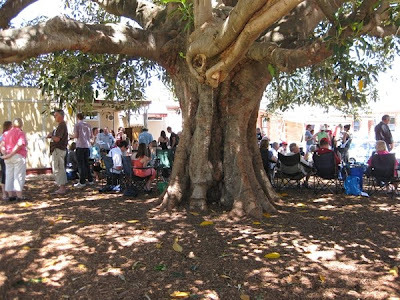 Moreton Bay Figs have been planted in Botanical Gardens, city parks, school yards and virtually every other area where people will tend to congregate. One tree can provide shade for well over a hundred people. 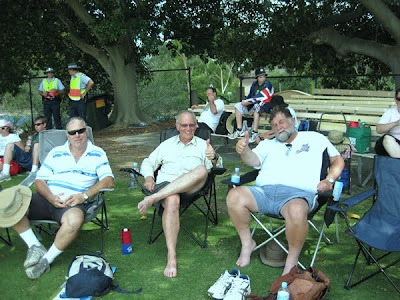 While watching a seven hour cricket match between Australia and the West Indies, we were most appreciative to be able to sit in the shade of a number of Moreton Bay Figs while the daily temperature peaked at plus 44oC. 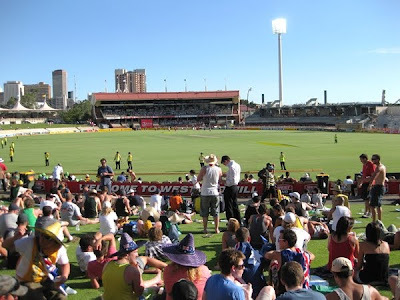 A couple of weeks ago, Rick had the pleasure of attending a cricket match in Adelaide. Australia was playing the West Indies. The match lasted seven hours, with tickets costing $25.00. It was excellent dollar value for a day’s enjoyment of sport. The game and experience is very similar to going to a baseball game. You sit in the stands, watch people, drink beverages and eat food from one of the many concession booths. The athleticism of the players was obvious as they competed for seven hours in the hot scorching afternoon and early evening heat. Even for spectators, the heat of the day was very draining. • The Oval Cricket park was beautiful. There was a very intimate feeling while we sat in lawn chairs on the crest of a hill watching the game under the shade of some very large Moreton Bay Figs. The scoreboard is believed to be one of the last actually working manual scoreboards. 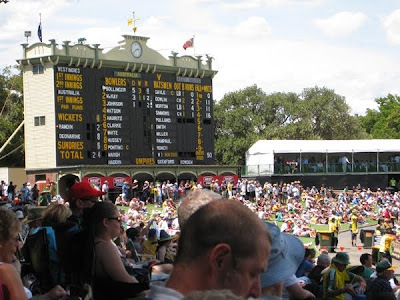 Apparently the people of Adelaide have resisted all attempts to replace the scoreboard with a modern electronic kind. It seemed to us that the presence of the old scoreboard added to the intimacy of the park and folklore of legendary cricketers having played in a bygone era. Manual Score Board and fans at game time. Boys enjoying the shade of the Moreton Bay Figs before the start of the contest. We had to get there early to get a good spot and stake out our turf. 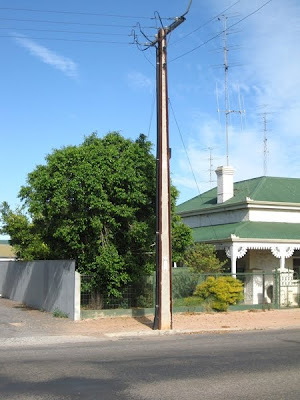 A “Stobie Pole” is the name given to the utility poles that dot the South Australian landscape. 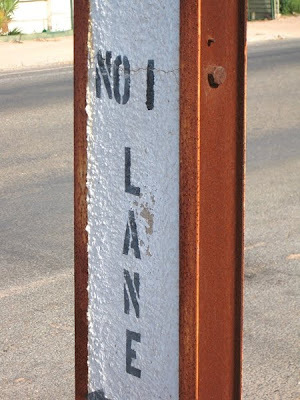 It is a pole made of two steel “I beam-like” joists held together by tie bolts and a slab of concrete in the middle. They are quite ingenious as they are made from easy to obtain materials since much of South Australia is void of any tall timbers that are suitable to use as telephone or power poles. Their steel and concrete frame make them resistant to hazards such as wild fire. We cannot understand why this design has not caught on in other arid areas. 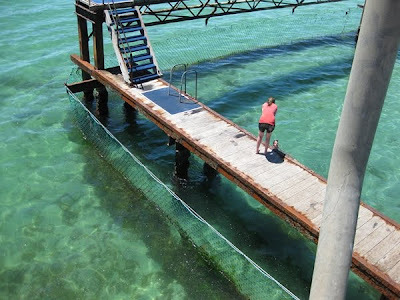 You will recall from the last blog entry titled “Kadina and the Yorke Peninsula” that there are many jetties up and down the peninsula. 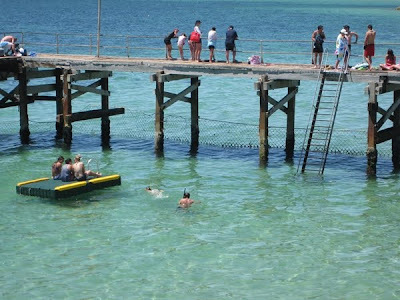 It is not uncommon to see shark nets associated with these jetties so that people can swim in comfort without the worry of a shark attack. If we are not swimming inside the shark net, we have made it a point to ensure that when we swim there are people further out in the ocean. Our Australian friends have jokingly said that sharks can sense fear, and will by pass an Aussie completely in order to stalk it’s cowardly and lily-livered foreign prey.